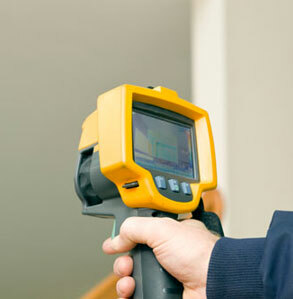 An energy audit is an assessment of a home’s existing condition relative to energy usage and health and safety factors. The audit process determines what measures can be implemented to save energy and to achieve a safer, more comfortable home. We use a variety of equipment and approaches to determine the energy efficiency of the structure including a blower door to measure the air leakage rate, together in conjunction with an infra red camera to reveal insulation levels and hard to detect areas of air infiltration. We also use other diagnostic tools to measure carbon monoxide and exhaust draft rates of your combustion appliances that tell us something about your systems efficiency levels. 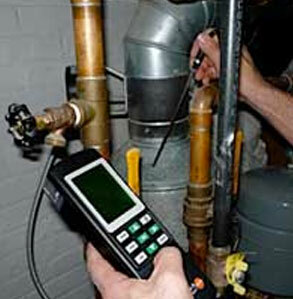 Additionally we test all of the accessible gas lines in your home for any leaks that may exist. After the energy audit we prepare a detailed analysis of our findings and recommendations in an energy audit report and a work scope for improvements, including a cost and energy savings analysis. The analysis uses data collected from the audit and usage data from the prior years energy bills provided by the homeowner. Our report includes the total estimated energy savings determined by the states energy modeling software, and with this we can qualify the homeowner for rebates. 0% financing is through this program as well, which is a great opportunity for homeowners to install improvements without a big out of pocket expense. An important tool that we use during the energy audit is called a blower door. 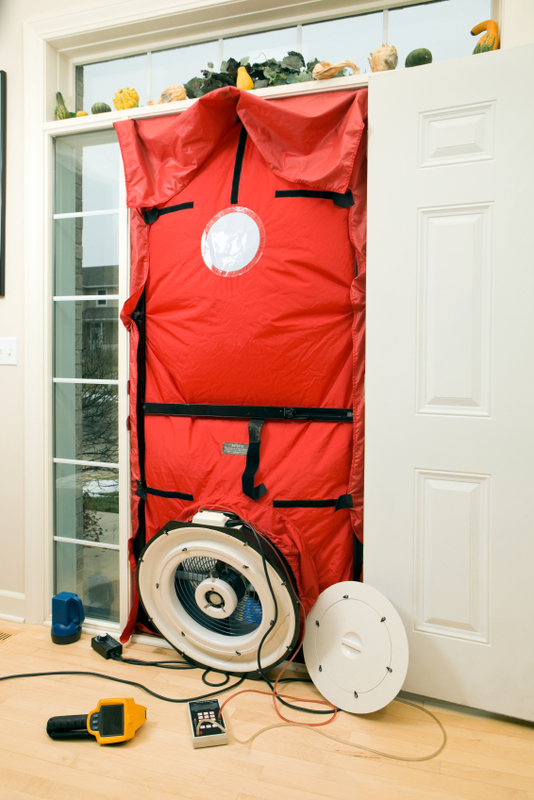 It is a big circular fan that fits into an entry doorframe and while running, depressurizes your home to measure the amount of air leakage that your home exchanges (leaks) to the outside. When used in conjunction with our infrared camera, we can see precisely where leakage occurs, sometimes in places you would never imagine. 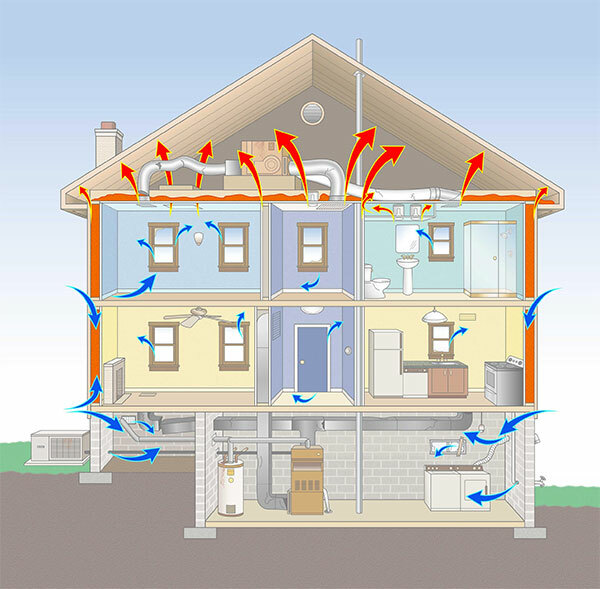 Aside from seeing where and measuring the amount of leakage that occurs, we calculate using a formula created by the Lawrence Berkley Laboratories what level of air leakage is good to have so that your home has the proper amount of air exchange to the outside to maintain healthy air quality levels. 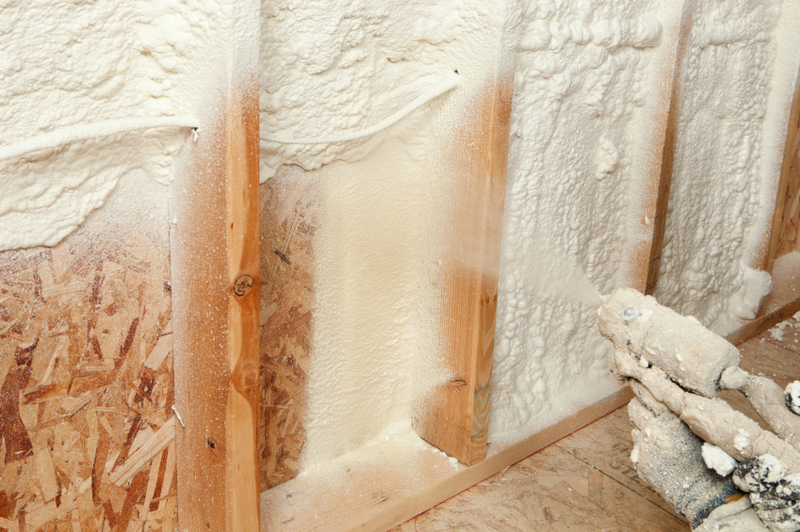 Air leakage is more significant in energy waste than the lack of insulation. 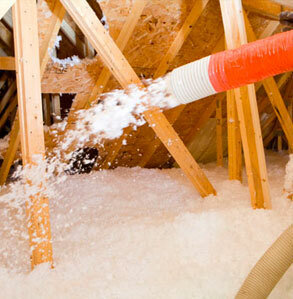 Air leakage is prevented by air sealing using spray foams and dense packed cellulose. A post blower door test will be performed if any air sealing work is performed to measure the resulting leakage reduction and to make certain the house has not exceed the rate for a healthy environment. The infrared camera is a great tool to use during the audit process. With the blower door running, the camera can clearly detect areas of leakage or connectivity to the outside. It can also record the temperatures at any given location to reveal those cold spots, for example, that make for dramatic temperature changes room to room in winter.. The camera also sees what insulation levels if any exists in the walls and ceiling and helps us recommend improvement measures. Equally important, the camera can also detect areas of moisture behind walls as well that could reveal potential mold problems. Considering the fact that the dynamics of the house may change with improvements, health and safety testing needs to be performed to determine if there are any issues that may adversely affect the occupants should the house become “over” insulated. This part of the audit process will include checking all exposed natural gas lines for leakage using a gas sniffer, checking the draft rates for the heating appliances and water heater using a manometer and measuring the carbon monoxide output using a flue gas analyzer. These measures can tell us about the efficiency of the appliances and if there are any potentially dangerous situations such as back drafting or exhaust gas spillage that can potentially occur..
We will also visually inspect the dryer vent, carbon monoxide levels in your oven, as well as moisture issues that may be present. To learn more about energy audits just give us a call, or watch this video from the U.S Environmental Protection agency and the U.S. Department of Energy: Energy Audit Explained ». Retrofitting a home with efficiency improvements the right way by taking the “whole house” into consideration, this often takes some “outside of the box” thinking, and Tom, our auditor and plan designer is that kind of thinker! Retrofitting is much trickier than insulating a home during new construction, and often builders get that wrong! Tom takes the time to really understand your home and he will design a plan that will work and be cost effective as well, addressing energy savings issues and comfort. Our retrofits can go very deep because we have carpenters on the job making it possible to access areas to install the right measure whether it be cellulose, fiberglass, cell foam, foam board or other application. When the plan calls for an oil to gas conversion, installing an air conditioner or simply upgrading equipment (furnaces, boiler, water heaters), we carefully size the equipment so it will run efficiently. Often changing one piece of equipment will effect others, ie: conversions require removing the oil tank and sometimes a larger gas line and meter, installing a new boiler may make it necessary to install a chimney liner for an existing water heater left to draft on it’s own up a chimney, or possibly it will need to be replaced by a direct vent type. We look at the big picture and explain it all in our energy audit report and retrofit. When a homeowner gives the green light on a plan we secure the rebate that they qualified for, confirm financing and apply for the permits necessary before we start the work. Or reach out, we'll call you!